I was on the fence about whether to make Thanksgiving dinner this year, but we bought the turkey this weekend so I’m locked in. I should be focusing on prep work, but chocolate helps me focus so I made a quick batch of brownies. Inspired by Jennifer at Bake or Break, I used the Max Brenner Brownies recipe. One issue with the Max Brenner recipe is that it’s for a 13×18 inch pan. Jennifer made the full batch, so I decided to try scaling it down to 1/3 of itself and baking it in an 8 inch pan. It worked perfectly. Like Jennifer, I used pecans instead of walnuts but I think these might have been better without the nuts or maybe with the nuts just on top. I usually love nuts, but in this case they seemed “in the way”. I also refrigerated the brownies before cutting. If you can’t tell from the ingredients list, these brownies are super rich – not overly sweet, but rich. At first I cut the pan into 9 squares, but wanting to fill people up on one single brownie, stomachache, I cut each square into 4 more squares to make 36 small brownies. Preheat oven to 350°. Line an 8 inch square pan with non-stick foil or line with parchment. Put the chocolate in a microwave-safe mixing bowl. Place the butter and cream in a saucepan set over medium heat and bring to a boil. Pour over chocolate and let sit about a minute or until chocolate begins to melt. Stir until chocolate is completely melted and mixture is smooth. Set aside to cool. Note: If chocolate doesn’t melt completely, you can microwave the bowl for 20 second and continue to stir. That’s why I suggested a microwave-safe mixing bowl. Add vanilla to cooled chocolate mixture. Whisk in eggs, one at a time. Whisk in sugar and salt. Sift 1/4 cup of the flour into the chocolate mixture. Using a wooden spoon, stir gently until combined. Toss nuts with remaining flour. Stir into batter. Spread batter in prepared pan. Bake 28-30 minutes, or until a toothpick inserted in the center comes out almost clean. Allow brownies too cool. Wrap and refrigerate for a few hours or overnight. With chocolate chips, 10 oz is about 1 2/3 cup, so I supposed chopped chocolate is about the same volume. I normally weigh it, though. That’s just an estimate. hi guys i was wondering desperatly if someone could tell me what 10 ounces equates too? OMG! I think I am going to LOVE the book… and try the recipe as soon as I come back from France after Thanksgiving!! There must have been something in the Texas air – I made über rich brownies (Ina Garten’s Outrageous Brownies) the other day and had the exact same thought when I cut them for a meeting… They ended up more of a brownie bite so we didn’t all go into a coma after lunch. I’ll have to try these! Thank you for reminding me that patience is rewarded – refrigerating a brownie like this is always well worth it. “chocolate helps me focus” You crack me up! I just licked my screen these looked so good. Tasted like Windex, not brownies. possibly the best looking brownies ever, will have to make them now to see if they live up! These look very delicious brownies. These were really dense and almost fudge-like. They were sturdy and firm so I know I didn’t underbake them, but they were quite chocolate-dense. They are calling my name!! They really look divine. I LOVE Max Brenner. Great breakfasts! Looks like another brownie winner with a heavy ratio of chocolate to the other ingredients! My favorite kind.I regret not making it to Max Brenner’s when in NYC this year — some of his sweets and pancakes shown on his website (with chocolate of course) looked completely over the top. This is a “must stop” next time along with Serendipity. Those look really good, kinda like my faves, the Dorie’s Tribute to KH Brownies. But these are probably even chocolaty-er/fudgier because the Dorie ones just have cocoa. They look like some I need to try. Sigh. I’m in the same boat as you–taking way too long to get on the T-day dinner bandwagon. I’m kind of not that thrilled this year as it’s just us and I don’t want to slave away in the kitchen when the boys hardly eat anything. Boring old turkey and mashed potatoes anyone? I love brownies in 8 inch pans because they are so much thicker and fudgier. Wow they look fabulous! 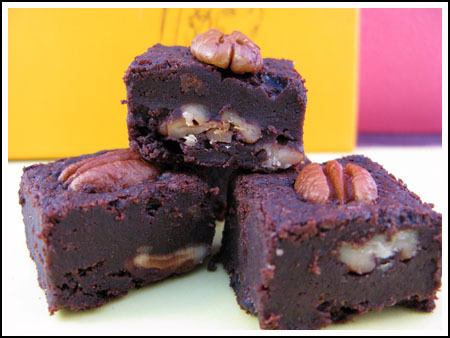 I’m on the fence about nuts in brownies. Sometimes I like them, sometimes I just don’t. Thanks for the recipe!